It was the beginning of the 20th century when mankind first tried to mechanize the work it was performing during road construction projects. As a result of this effort, the first road construction machines began to appear. The design of a dredger ship was introduced in 1809 in St Petersburg and the design of a steam driven excavator in 1835. Even with all those advances however, the road construction industry initially developed very slowly. As of 1839, there were only 7 excavators in the entire world. The grinding machine was first presented in 1858, the elevating grader in 1875, and the grader in 1887. The latter two being horse-drawn units. The latest breakthroughs in the history of the road construction industry were connected with the invention of the caterpillar track and diesel engines. In 1912, the first crawler-mounted excavator was put into service. There has been a great leap in the road construction industry due to the discoveries made in the 20th century. As a result, in the hi-tech market today there is a great variety of automated or semi-automated road building machines. They have allowed for significant cost savings and manual labor reduction while building and repairing roads and highways throughout the developed and developing world. Before paving a roadway, it is necessary to perform the following operations: (1) to cut the trees, bushes; and (2) to remove stumps. Special units such as brush breakers and stump diggers can be fixed to tractors or other vehicles to perform the tasks listed above. A scraping machine is designed to lift, move, and unload soil. A bulldozer is a tractor, equipped with a blade for moving earth. It is meant for digging and pushing large quantities of soil for short distances. 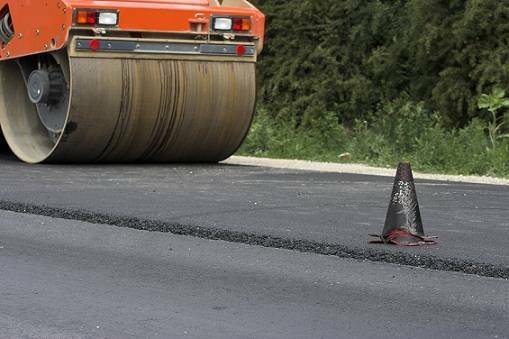 Sometimes, sets of road construction units are used to pave the roads with asphalt concrete. The modern asphalt concrete mixer and an asphalt spreader are among that set of construction units. The asphalt concrete mixers blend sand with bitumen when the asphalt spreaders pave the road with asphalt concrete. Polymer bitumen modification is considered to be a very important processing step that can performed on GlobeCore’s UVB-2 units. They produce bitumen as well as asphalt concrete mixtures with predefined properties to extend the service life of the road pavement. The concrete spreaders and concrete pavers are mostly used when paving the road with cement concrete. The following is the list of the road construction units that are used to maintain and repair roads: (1) heater-planer; (2) surface planning machine; (3) road drag; (4) motor roller; (5) snow-plough; (6) sand-spreading machine; and (7) snow-loader and other units. Such units as ballast tamping machines, track-laying machines and cribber adzes are used to build and repair railways. The ballast tamping machine is used to pack the track ballast (crushed stone, sand, gravel) under the railway tracks. The track-laying machine is meant for mechanized rail and sleeper laying and cribber adzes are used to cut side channels along the rail routes, and clean road ditches. The units listed above are energized from the energy source, located on the locomotive. The latter also serves as a means of transport.